There are reports in South Korea that; Samsung has shipped its newest Galaxy s8 and it will be available in stores this Friday. 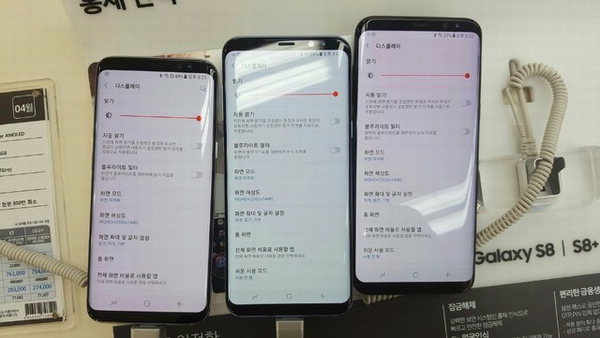 But, there are also news on Internet and local media of South Korea that, Samsung pre-ordered Galaxy S8 models are shipped with tinted RED screens. The Pre-orders from Korea has been delivered and users are complaining about display screen of Samsung Galaxy S8 has a Red tint. The news has immediately grabbed the attention of all social media platforms and Internet. which triggered an immediate reaction from SAMSUNG spokesperson. He assured that this isn’t a quality issue and Galaxy s8 models are absolutely fine. The Red display can be changed from the settings menu of smartphone. Some customers also posted on social media platforms that; they visited the Samsung stores and were told to replace their phones. However, there aren’t any proof about these reports – The galaxy s8 model is the first “Deep Red” OLED display technology smartphone. The news was first reported by the Korean tech-forum “PPOMPPU“. There are also reports that Galaxy S8 screen has topped the search engine terms on Tuesday in Naver (South Korea’s biggest search engine). The Galaxy s8 has topped the people’s expectations and it received more than around 700,000 pre-orders only from South Korea. The company has already broken the all pre-order records and the sales is expected to increase even more once the S8 models hits the stores worldwide.